Our today’s featured artist is Shawnna alias garbaje! She has pretty recycled jewelry in her shop! Please check out her shop! I grew up in a little country town about an hour east of Cleveland, Ohio. After highschool, I attended a liberal arts private school where I graduated with honors and earned a Bachelor’s Degree in Marketing and Business. I really enjoyed the business classes, however I always felt the urge to take advantage of the liberal arts education and branch out into other areas that the college offered that were unrelated to my major. So I enrolled in as many elective art classes that my schedule allowed for and wound up graduating a semester early because I maxed out my credits every semester. Come to find, this saved me a ton of money! When I graduated in December of 2008, I immediately found a job and am still employed as a front desk manager of a salon and spa. I enjoy the people I work with and I enjoy what I do, however my favorite part of the day is when I get to be home with my family and set up my work area to make my bracelets after my son goes to bed. 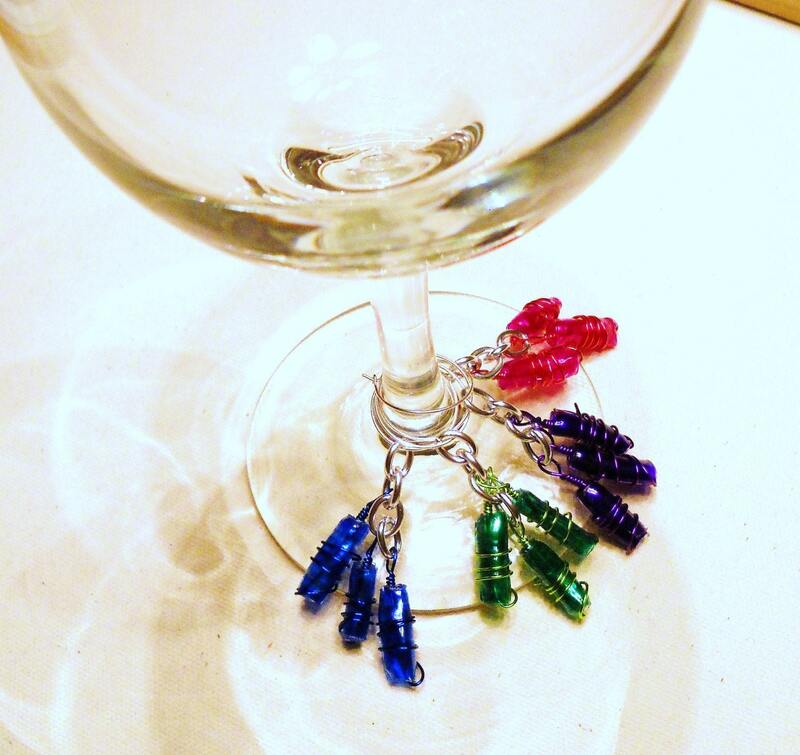 When I’m not making my recycled jewelry, I really enjoy spending time with my family, cooking, being outdoors, reading when I get the chance, Facebooking (best invention ever), recycling, the casino, and I’m known to have an occasional glass of wine! My style preference is a direct reflection of the items I make. I don’t know if there is a formaldesign style name that I’d give them, though. Here’s some adjectives that I’d use to describe them: fun, funky, bright, unique and ecofriendly. I hate purchasing anything (a shirt, a purse, shoes..) that will only go with one outfit that I own. I prefer to go for the items that I can picture myself wearing on an everyday basis. That’s how my bracelets are — they will add a little fun(ness) to any outfit. I am driven by all the successful people who were told that their dreams weren’t realistic! I absolutely love hearing people’s stories and listening to how they made it to where they are now. Whenever I am feeling unmotivated, all it takes is for me to revisit some of my favorite blogs (Gussy Sews is my absolute favorite) by young women who have accomplished, and are still working on accomplishing, their dreams. I’m also very emotionally driven and I have a very strong desire to be truly happy during my lifetime and in my career. For some people, that may mean climbing up the corporate ladder, which I admittedly dreamed of at one point when I was in college. However for me now, I want to be able to combine my passion for creativity and my overwhelming desire to be a stay at home mom. In summary, I have been a creative person my entire life. I didn’t have to choose it, I have always had it. I’ve gained the business experience through college and my career and I just cannot wait to combine the two into a full-time passionate business that I’m determined to make it. My ultimate goal is to start a handmade business from home that earns me enough money so that I don’t have to pay a babysitter everyday and work for somebody else. I feel like I have a very big opportunity to do something very exciting with the combination of my business background and my creative side. 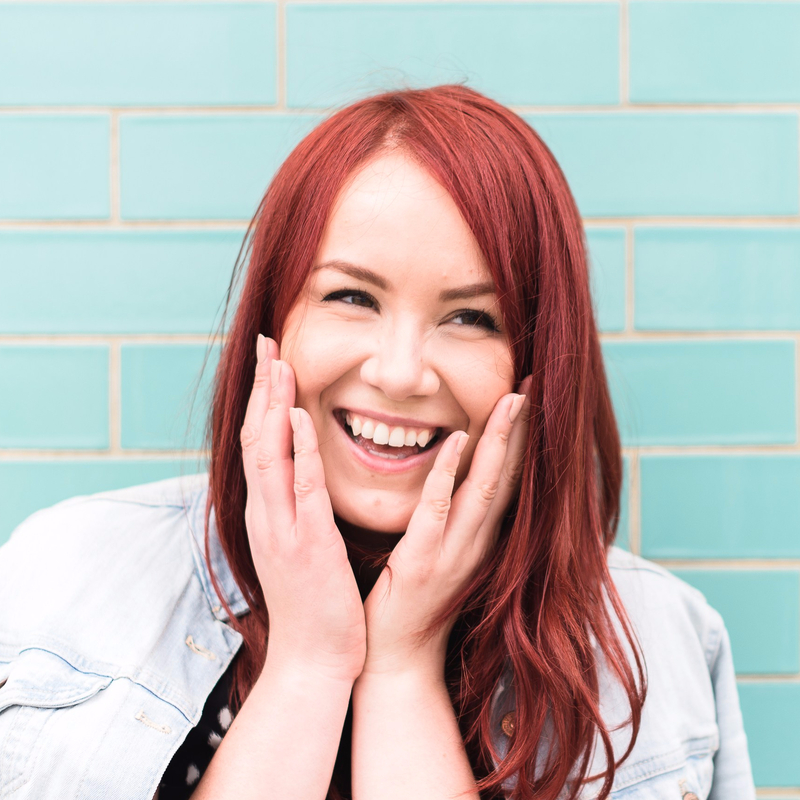 In five years, I see myself running a successfully evolving handmade business. When I’m at my workstation, I’m doing what I was born to do. With every sale comes a huge amount of satisfaction to me, knowing that I created something that somebody else is willing to pay for and enjoy for themselves. The ideal customers that I’m trying to target would be women between the ages of 16-40 I’d say. Most of them probably appreciate the idea of purchasing something that is not only one-of-a-kind, but also affordable and ecofriendly. This said woman is not very hard to come by, therefore my opportunity to grow and gain exposure is a definite possibility. I want my items to be known for their originality, earth-friendliness, quality, and affordability. Nothing in my shop is over $20, which makes every item a realistic purchase for just about everyone. My shop truly is one-of-a-kind. The recycled water bottle bracelets that I make are my most popular items and you can’t come across them anywhere else. 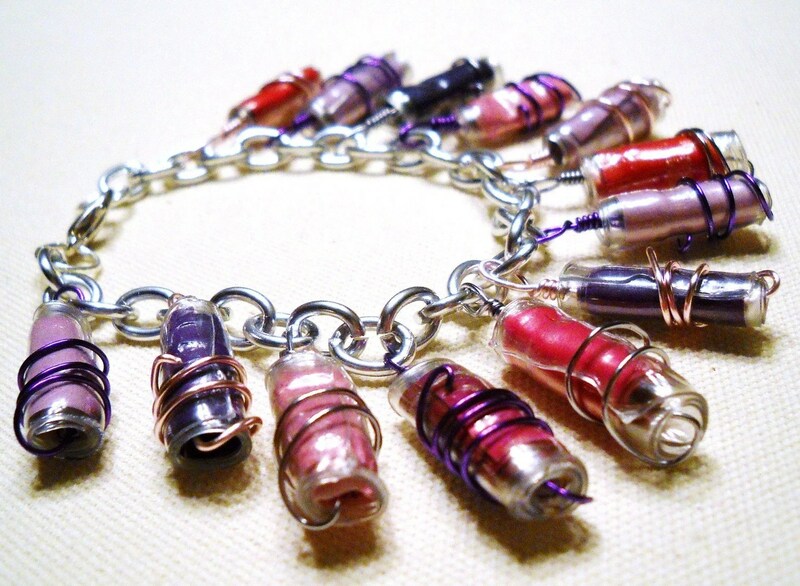 I hand-roll each plastic charm from water bottles and wrap them in brightly colored copper wire. 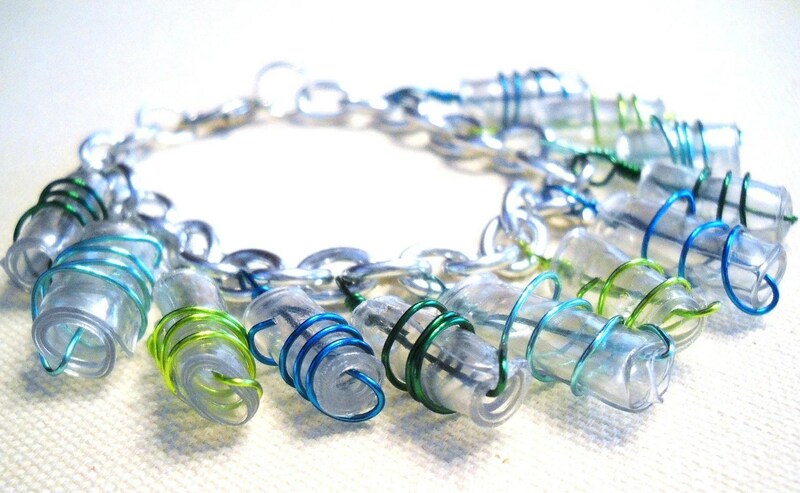 I have another variation of the recycled water bottle bracelet, which is combined with recycled magazine pages and makes for an even more original and standout piece of jewelry. People may stumble across my Garbaje when looking for an ecofriendly piece of jewelry. Or possibly just a fun and unique bracelet that boasts handmade. Every single item that is for sale in my Etsy shop comes from atleast one recycled item, whether it be a water bottle, a soda bottle, magazines, or pop tabs. Recycling is very appealing and when combined with fashion can be a very exciting trend. My message is that it’s entirely possible to rock a piece of recycled plastic and look good doing it. Jewelry doesn’t have to be super expensive or mass-produced. A handmade piece of jewelry (or any accessory for that matter..) is always something worth talking about and appreciating.